In a bowl, Mix all the dry ingredients except club soda and pumpkin seeds. Mix everything well with a fork. Make a well in the center of the dry ingredients. Now add club soda to the flour. Measure carefully, trying not to let it froth up. Stir everything well to combine. Grease the pan with some oil or butter. 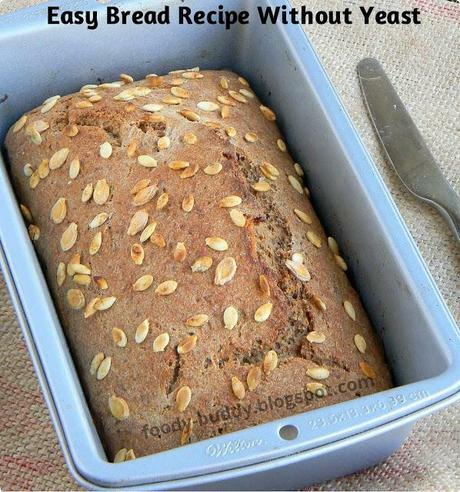 Transfer and fold the dough into greased baking bread pan, sprinkle some pumpkin seeds on top. Bake at 392 degree F (200 degree C) for 45-50 minutes. Check it by inserting tooth prick in the center of bread, if it comes out clean, then your bread is ready. 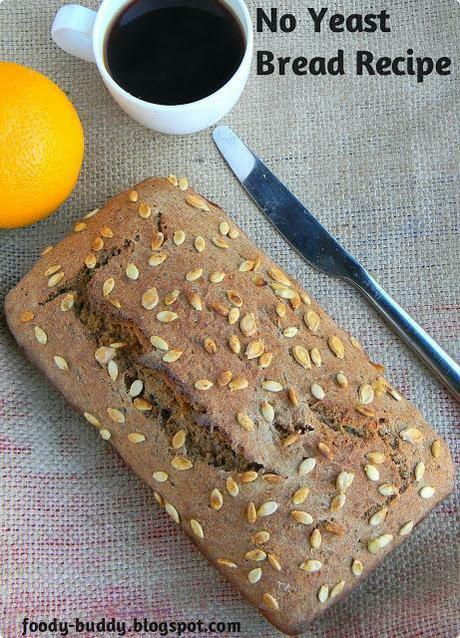 Allow the bread to cool down for 10 mins, then carefully take it out from the pan and enjoy the slice of healthy bread with hot soup !!!! To make the bread more flavorful, add some mixed herbs or Italian seasoning or crushed garlic to the flour. For topping, you can use any seeds like sunflowers, cucumber seeds, sesame seeds or any chopped nuts. If you want to change the bread to alcoholic version, add beer in place of club soda. Rich in fiber, helps in proper functioning of digestive tract and lowers the cholesterol and metabolic syndromes. Reversing the weight gain process. Lowers the risk of diabetes. It has powerful antioxidant, which is vitamin E, good for skins.